Deep, enriched, sandy loam for outdoor planting. Good quality potting soil enriched with compost can be used in containers. Ginger prefers part-day shade when grown outdoors in warm climates. In cooler climates, grow ginger in containers placed in sun. Move to partial shade during summer heat waves. Many types of ginger are winter hardy to 20F (-6C), but none can tolerate frozen soil. In most climates, this tropical plant is best grown as a summer container plant. Fertilizer is seldom needed when ginger is grown as a perennial in tropical or semi-tropical climates. When ginger is grown in pots, fresh soil is gradually added as more stems emerge and the plants grow taller. Nutrients from the fresh soil help feed the plants, but container-grown plants also need regular feeding with a balanced organic fertilizer through the first half of summer, while they are growing rapidly and producing new leaves. Start with a purchased plant in spring, or force a fresh root to sprout by planting it in seed starting mix and keeping it in a warm place where temperatures range between 70 and 80F (21 to 27C) for 4 to 6 weeks. When sprouts appear, gently transplant the root to a 3-gallon (11 liter) pot, covering the top of the root with only 2 inches (5 cm) of soil. Add additional soil as the stems grow taller, and water as needed to keep the soil lightly moist. 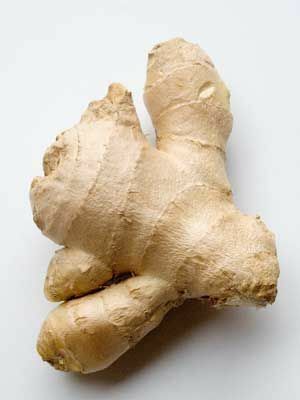 Ginger is most often grown in double rows, spaced 12 inches (30 cm) apart, with open working space between the double rows. Ginger thrives on warmth. Where summer nights are cool, ginger produces best when grown in a greenhouse or high tunnel. Ginger stops growing new leaves in late summer when nights become longer. Wait as long as you can to harvest the roots, but before freezing temperatures. Shake off loose soil and then rinse roots with a strong spray of water. Store “baby ginger” in the freezer, and take out small pieces as you need them in the kitchen. Use only perfect, blemish-free roots when forcing ginger to bud in spring, because ginger roots can carry root-rot diseases that can spread to the garden.